Overslept. Lost jacket. Stayed up too late binge watching Netflix. Sound familiar? For 17-year-old American snowboarder Red Gerard, this happened on the morning of the men’s Snowboard Slopestyle competition at the Olympics. “You have to wake up so early. I’m just not used to waking up early at all, and I just slept in. It was a little mess of a morning,” Gerard said. Clearly he wasn’t phased, as Gerard took home the gold, marking the first gold medal for the United States in the 2018 games. Oh, and then Gerard casually flew back to America for Jimmy Kimmel, and days later returned to South Korea to compete in his final event, men’s Big Air. The Scene: A packed Phoenix Snowpark watching men’s Snowboarding Halfpipe. 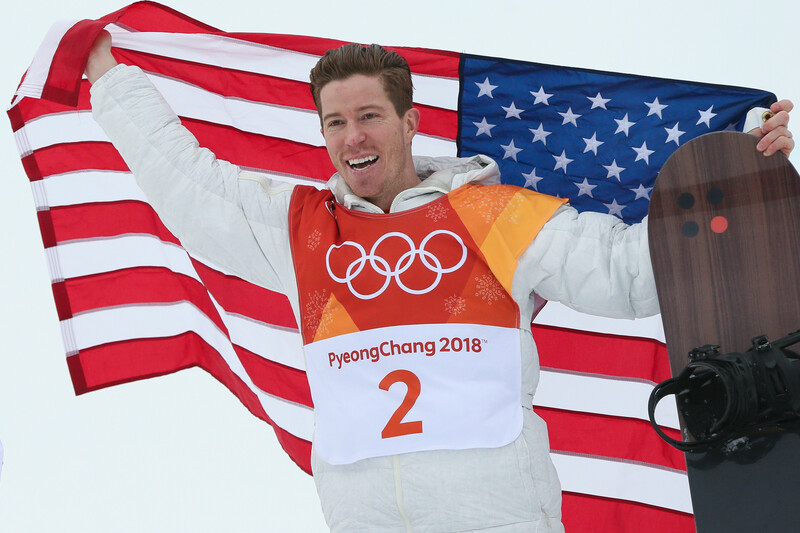 The Stage: Shaun White, sitting in second place coming into his final run, searching for his third gold medal, one that had eluded him since finishing off the podium at the 2014 Sochi Olympics. White nailed back-to-back 1440s (four 360 degree spins) to knock Japan’s Ayumu Hirano out of the top spot and won gold with a score of 97.75. “I knew I did a great ride and I was proud of that and I could walk away with my head high, but when they announced my score and I’d won, it crippled me,” White told NBC. His gold medal run marked the 100th all-time Winter Olympic Games gold medal for the United States. All eyes were on the German, Felix Loch, who was going for a three-peat gold in men’s singles luge. Loch’s dreams were crushed after a error on the ninth turn sent him off course for just a few seconds. Those few seconds were enough to cost him gold and even a spot on the podium as he finished fifth. American Chris Mazdzer won the first-ever medal in singles luge for the United States, a silver medal with a time of 3:10.728, just seconds behind the gold medalist David Gleirscher of Austria (3:10.702). Chloe Kim Likes Food. Enough Said. The 17-year-old, who was too young to compete in Sochi, already had the gold medal locked up before her final run in Pyeongchang when she showed why she is the new queen of snowboarding by earning a nearly perfect score of 98.75. The U.S. men’s hockey team, which consisted of college players and professionals out of European leagues after the NHL decided against sending players to Pyeongchang, lost to the Czech Republic in a shootout, 3-2, in the quarterfinal matchup on Feb. 20 to end their run toward a medal. The four players out of the NCAA were bright spots for the Americans. Ryan Donato (Harvard), shelved five goals for the tournament, the most of any player. Despite it being the second-straight year the men’s team failed to make the podium, the women’s team secured American dreams of a medal by defeating Canada in a shootout, 3-2, to win the gold. Remember the last time you saw North and South Koreans on the same team, let alone in the same room together? Yeah, no one does. But, despite the prolific tension between North Korea and South Korea, they put aside political differences to form a unified women’s hockey team. But that’s not even why they’re making headlines. While only sending 22 athletes to compete, North Korea sent 200 cheerleaders, who are trained under the harsh regulations by Kim Jong-un, to spread positivity throughout the games. Despite going winless in competition, the unified squad was met with roaring cheers from the audience. “With everything that happened to them, prior to the Olympics, for them to come together like this and compete like this in the Olympics, it’s remarkable,” said coach Sarah Murray, a Canadian citizen. If you watched speed skating, you most likely saw the Dutch on top of the podium. In the 2018 games, the Netherlands has earned 16 total medals, 13 of which have come in the speed skating competition alone. Out of the 123 total medals, the Netherlands has won in Winter Olympic history, 116 have come on the speed skating track, according to USA Today. While speed skating is a part of Dutch culture, their excellence on the oval wasn’t because they use skating on their frozen canals as their way of transportation, contrary to what Katie Couric suggested on NBC Primetime Olympic Coverage. Just 11 months ago, Canadian snowboarder Mark McMorris, 24, laid injured for two hours after crashing into a group of trees in the British Columbia Backcountry before help arrived. McMorris was airlifted to a local hospital where he spent the next 10 days recovering from just a few broken bones: a broken jaw, broken ribs, broken arm, ruptured spleen, stable pelvic fracture and a collapsed lung, according to ESPN. Skip to February 2018 and McMorris is back competing in the Winter Olympics. He took home the bronze medal in the men’s Snowboarding Slopestyle competition behind Gerard and fellow Canadian Max Parrott. Borrow American superstar Mikaela Shiffrin’s skis. Check. Be the first person to compete in snowboarding and skiing at the Olympics. Check. Win a gold medal in an event you entered ranked 43rd overall. Check. Ester Ledecká, the Czech snowboarder and skier, stunned her competition by taking home gold in the women’s Super G as she edged out defending gold medalist Anna Veith by 0.01 seconds, with a time of 1:21.11. NBC didn’t even broadcast her run because they didn’t think Ledecka had a chance of reaching the podium, let alone win gold. Photos Taken From Wikimedia Commons, olympic.ca and cnn.com.